Mangatoro Scenic Reserve, previously known as Ngapaeruru Scenic Reserve, is a fine remnant of lowland mixed podocarp forest. Small to medium size matai, kahikatea, rimu and tōtara abound in this reserve, on a small floodplain next to the Mangatoro River. Department of Conservation literature stated that "A giant tōtara, said to be one of the largest in New Zealand, is a highlight [of the reserve]". The largest tōtara found in the reserve is right on the loop track, a few metres from the junction with the eastern entrance track. A nice specimen, the tree does not, however, rival the largest specimens of the species. 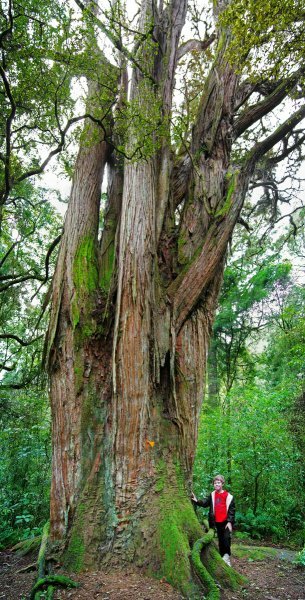 The tree is of flangy, short boled form, and is likely the tree described by Dr. Patrick Grant in his survey of Hawke's Bay forests as "205 cm [dbh] with a short bole and large rounded head". In describing a tree, with similar form, of 260 cm dbh at Gallen's Bush, Hawkes Bay , he states that "this form of tree is younger" than longer boled tōtara of similar size (Smillie, M. 2012). Department of Conservation - Explore Hawkes Bay (1.4 MB PDF). Shooting vertically to highest visible foliage. Breaks into 6 or 7 leaders from 2 m.
06 Oct 2012 Smillie, M.J. The reserve is approximately 14.5 km from SH2 in Danniverke, on Ngapaeruru Road, 600 m from the intersection with Weber Road. The tree is on the loop track circling the reserve, about 15 minutes walk from the main entrance, or 2 to 3 minutes from another entrance a few hundred metres up the road. The track underfoot is indistinct in places, but well marked on trees. The track can also be quite muddy, especially in the section between the two entrances.